Each year we offer 6 fabulous guest prizes which anyone attending our Annual Celebration Lunch can win. 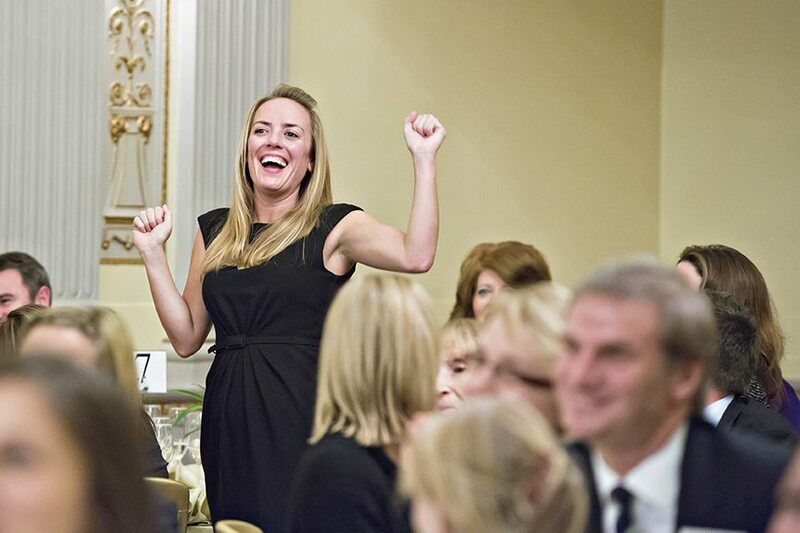 This is how one of our 2012 guests reacted when she heard she’d won a fabulous gift. Hanbury Manor . Dinner, bed and breakfast for two people in a Prestige bedroom with lunch prior to departure at this quintessentially English country retreat. £200 voucher to spend with The Fold London, a contemporary fashion label that embraces and inspires the modern, professional woman. Treat yourself to some amazing new eyewear with a £200 voucher to spend online with Glasseswebb or at the MOSCOT Originals Pop Up Shop in Leigh-on-Sea where you’ll be able to view some of our other collections, including pieces from Barton Perreira, Clayton Franklin & our unique Vintage archive. A yumbles hamper valued at £130 full of scruptious goodies.